"Should the self destructive white privilege fueled racist tendencies of white voters prevail on Tuesday, we will be stuck with people who hate us having offices in the Eisenhower Executive Office Building and the Justice Department gleefully making policy backed by the federal government that rolls back all the human rights games we have made since Stonewall. ". In the wake of the disastrous 2016 election, one of my Black lesbian homegirls told me a story about a conversation she'd had with two white gay men at her job who were gleefully bragging about voting for Trump. "He's going to shake this PC crap up," one of them said while the other recited Trump's demonstrably false narrative about the country being 'terrible' under President Obama. My homegirl then calmly reminded both of the gay Trump supporters they had just voted for the guy who would take away gay marriage. Upon hearing that comment, their previously gleeful expressions turned to shock and horror. "He can't do that, can he?" one of them asked her in a concerned tone. "He most certainly can, now that you voted for the guy who will put an anti marriage equality justice on the Supreme Court, and has Mike Pence as his vice president egging him on to do it,"
I'm recalling that now year old conversation because I thought about it as I read the Washington Post story by Colleen Curry in which she talked about the epiphany she had that gay rights weren't safe. Well, if you had talked to any member of the Black, Latinx or Asian TBLGQ community prior to or since the 2016 election, we could have told you that our community's human rights aren't safe based on our people's long tortured human rights history in the US and our people having to constantly fight tooth and nail just to have our humanity and human rights recognized. As a matter of fact, just four days before the 2016 election I wrote a post that stated in blunt terms that the humanity and human rights of trans people were on the ballot. There was a clear choice in this 2016 presidential election in terms of who needed to be in the White House if we wanted as a community continued progress on TBLGQ rights issues But far too many people in this community were more committed to hatin' on Hillary than electing her to become POTUS so that we could have continued our TBLGQ human rights progress. My people's history is full of stories like the Reconstruction, in which we made fantastic human rights progress after emancipation only to have it wiped out because of an at times violent conservative backlash that erased those gains before the turn of the 20th Century and saw the birth of Jim Crow Segregation. Anyone with a grasp of American history and who was paying political attention over the last several decades could have seen this same pattern coming in terms of TBLGQ rights. Black women, and especially Black trans women saw this coming which is why we were voting at a 94% clip for Clinton and the Democrats to avoid this disaster. Rights that you gain by executive order and court cases aren't safe and can be easily reversed. The only way to make them permanent or harder to roll back is to pass them legislatively To pass them legislatively, you have to have either TBLGQ legislators or allies doing so. Elections matter. 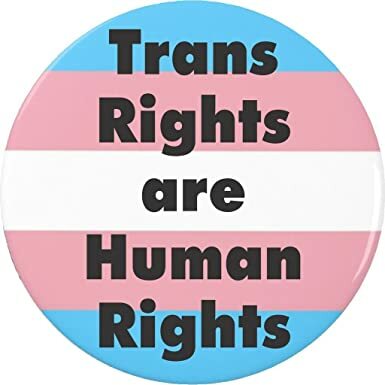 As long as the Trump misadministration and people hostile to us are in charge in Washington and our state capitols, TBLGQ human rights will always be under attack and we must fight tooth and nail to ensure there's no slippage in our human rights coverage. .